Catching an angelic glow on one of our runs on the first day. There are a few great pieces floating around in my sphere of the internet - nothing unusual. Heather got a discourse going about the dirtbag lifestyle while Gina got my brain going in all different directions with her discussion about balancing what we think we should want with what we actually want. I'm still in search of balance between all of the things that matter to me. I've learned a lot in the past year and also find myself wishing there were more than 24 hours in a day. I'd spend those extra hours succeeding professionally, with all of the people who matter to me, doing the activities I love, and recovering from all of it with a solid nine hours of sleep. Regardless, I'm pretty content with the balance I have now, the most recent result of which was a weekend warrior-style jaunt up to Killington Ski Resort in Vermont with a group of new and old friends. 1. a person who participates in an activity only in their spare time. 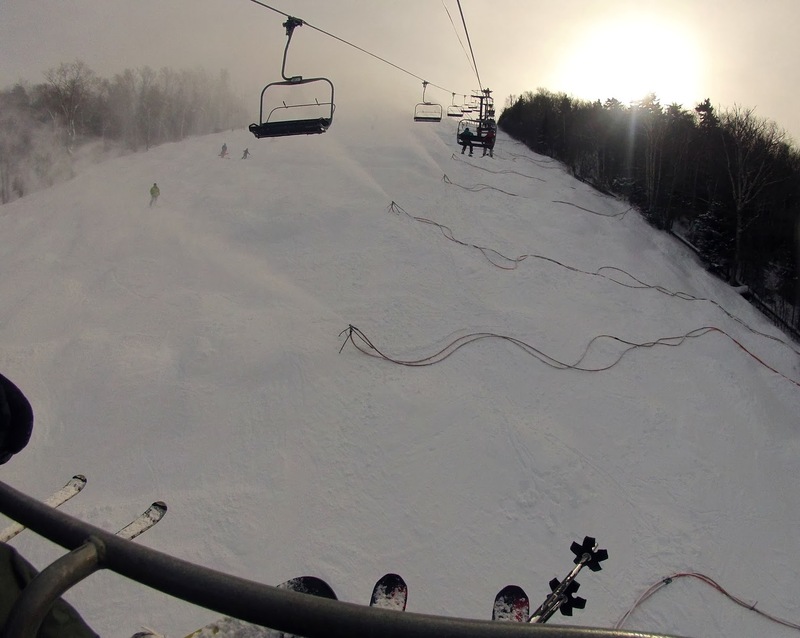 One of our first runs of the weekend, taken with the GoPro HERO3. Turns out, it takes great video and pictures! After getting up almost early enough to catch the first lift on Saturday, we opted to explore the northern side of the mountain on our first day. Some of the lifts provide access to green runs, but the majority of the terrain available via Snowshed and Ramshead put us in blue square, black diamond and double black diamond territory. 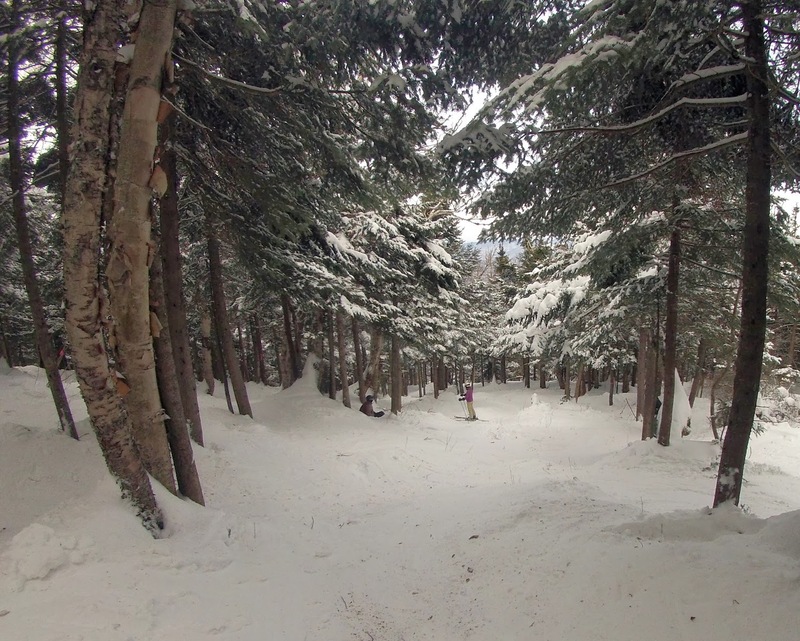 I wasn't experienced enough to tackle any of the glade runs on my first trip to Killington, but with two more years of skiing under my belt, I was excited to head into the trees. By the end of the first day, we'd had enough of straight, steep runs like Ovation and Launch Pad. Most of the wide blue and black runs were icy, both as a result of the climate and hundreds of skiers pushing natural and man-made snow down the mountain. In the middle of Squeeze Play on our second day at Killington. See if you can spot my friend Lauren! We'd been eying Squeeze Play, a blue glade run, and though I'd never done a full run in the trees before, I dropped in with the encouragement of my friends and hoped for the best. Of course, it was terrifying choosing a line, hoping I'd be able to follow it, then coming up with a plan B if I veered off my chosen course. I learned that the more tense I was, the more likely a fall was, which helped me relax. I also learned to trust in my ability, including my ability to stop if I needed to. We parked near the Skyeship gondola on Sunday to save driving time and to give us access to the southern side of the resort. With the variety of terrain and number of runs, I could ski Killington for weeks and never get bored. In addition to taking on new terrain on Bear Mountain and Skye Peak, I told a friend from Philadelphia that I'd ski two of her favorite runs. However, when I made the promise to try Somewhere and Nowhere, I didn't know they were black diamond glades. The previous day's runs on Squeeze Play had given me confidence, and after our group made it down that run again without any trouble, we headed up to the top of Skye Peak so I could fulfill my promise. A wide-angle look at Somewhere with the GoPro HERO3. I swear angle makes the trees look further apart than they were! On both runs, dropping in was the scariest part. Once we made it into the trees, I couldn't have been happier. It was quiet, peaceful, beautiful, and I managed to keep up with the group as we made our way down the mountain. The challenge was exhilarating and I love the fact that it's impossible to be cold when you're skiing in the woods. We made it down both Somewhere and Nowhere without incident. It was a perfect way to end the weekend. Snow guns blazing on our last run of the weekend. We carpooled, which meant only needing to fill two cars with gas. Fitting eight people, plus gear, into two cars definitely helped save some cash. The master planners for the trip used airbnb to find our condo, a beautiful spot on top of a slippery hill in Plymouth, Vermont. Though ski-in-ski-out accommodations were available at the base of Killington Resort was available, we opted to save a bit on lodging by getting cozy in a smaller place a short drive from the resort. I used Liftopia to save a bit on lift tickets; my two day pass to Killington was around 15% cheaper than if I'd bought single day tickets at the mountain. 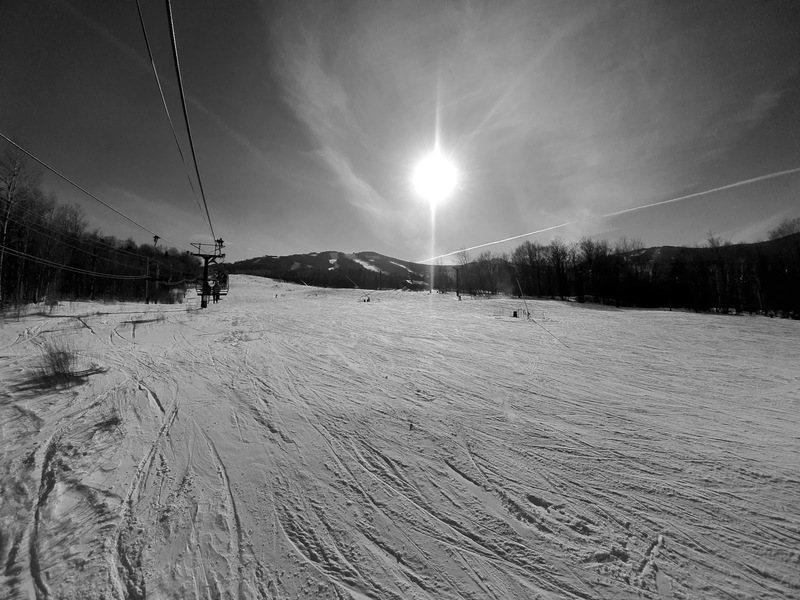 Killington's website also provides discounted packages if you purchase in advance. We grocery shopped upon arrival, which meant we could cook group breakfast before we left to ski, pack lunch, and have a "family" dinner when we got back. If you're a weekend warrior like I am, how far are you willing to drive for a trip? 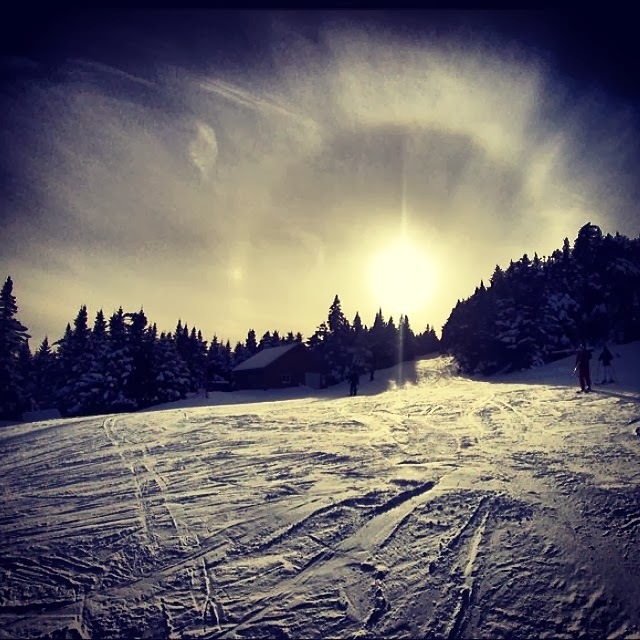 What are some of your favorite money-saving tips for ski trips? 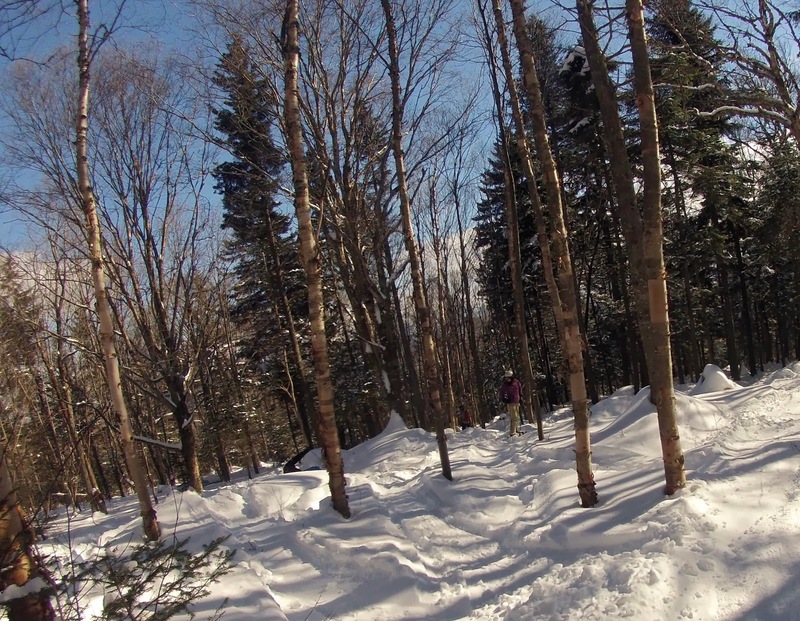 If you've been to Killington, what are some of your favorite runs? Sound off in the comments! So far my record is 8.5 hours each way. Dang, that's a while! Though to be honest, our drive home from Killington took about that long when we ran into a big snow storm. Where'd you go? Went to Rocktown in northwest GA for the weekend. Planning on going back or to LRC in TN in March.